Eight year-old Sarah loves to spend time with her grandfather. He walks her to school every day, and picks her up in the afternoons. They enjoy each other's company - playing, building things, and chatting together, but Sarah notices that her Grandpa gets sad sometimes. Her father explains that her Grandpa once fought in the Vietnam War, and he warns Sarah not to ask any questions about it, and to leave her Grandpa alone when he is feeling down. 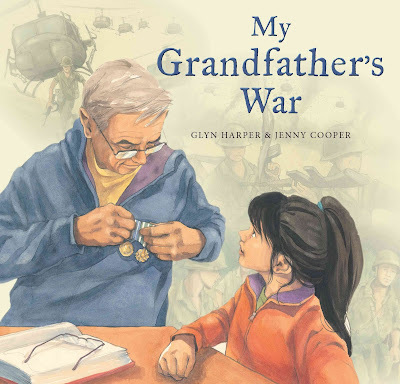 But one day, Sarah works up the courage to ask her Grandpa about the war, and as her Grandpa explains the time he endured in the military, she gains a better understanding of it. Sarah discovers that her Grandpa was a brave young man, and that after all of these years, the war still has an impact on him. My Grandfather's War is a fantastic book that explores the topics of PTSD and the legacy of war in a sensitive manner. And with this year marking the 50th annivesary of Vietnam War's longest battle, Khe Sanh, this is a timely resource that is well researched. It is recommend for readers aged 5-10 years old.